Natural oils that can be used with essential oils for massage and body treatments. Carrier oils are natural vegetable, seed or nut oils used as a carrier for diluting essential oils. Just add some of your favorite essential oil and you have a customized skin care treatment. These oils also have therapeutic value and are very nutritious to the skin. Great for all kinds of skin and body care, as well as body treatments such as massage. These oils may also be used alone without the addition of an essential oil. Rich in vitamins A, B1, B2 and B6. Relieves dryness, itchiness, and flaking. Very soothing. Avoid using on those with nut allergies. A light but deeply penetrating oil. Can be added to a body blend. Blended with soothing, moisturizing olive oil. Helps reduce soreness and swelling, making it ideal for massaging clients who are tender or sore. Highly nutritious, can be used for all skin types especially dully, dry and dehydrated skin. Pale yellow with little odor. Extremely high in gamma linoleic acids. An excellent oil for facial blends. For all skin types, but especially suited for mature skin. An infusion of marigold flowers in sesame oil. Light textured and yellow to orange. Anti-inflammatory and healing properties. Light, non-greasy and easily absorbed. Excellent for hair care. Provides high slip in body massage. Fine, golden yellow oil with a light, sweet aroma. Rich in vitamins E and F plus minerals. Good for dry, aging or chapped skin. A light oil with a non-sticky texture and high slip. Pale yellow, light in texture. Nutty and thin. Particularly good for oily skin. This oil is actually a waxy ester that is derived from Jojoba, a desert plant. Of all the oils it is the closest to sebum, which makes it excellent for balancing and soothing skin and hair. High in Vitamin E, it is an ideal choice for facial massage. Pale yellow oil with a slight nutty aroma. Light and penetrating. Contains Vitamin A. Good for dry and aging skin as well as sunburns. High in anti-oxidant vitamins and gamma linolenic acids. Very healing, good for pre- and post-operative skin care treatments. Infused in Sesame oil to produce a soothing oil with therapeutic properties. A light, yet rich oil. Loaded with vitamins E and B, magnesium, phosphorous and calcium. It is a good choice for all skin types, but a favorite for those with sensitive skin. It is also useful for treating eczema, rheumatism and arthritis. The preferred massage oil of Ayurvedic practitioners. Offers strong anti-fungal properties. Derived from sunflower seeds, it is a light-textured, golden yellow oil with a slightly nutty aroma. 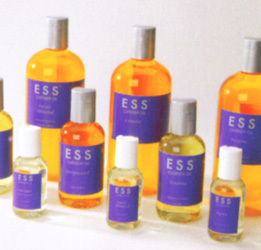 Popular among massage therapists because it is practically allergy-proof. The preferred oil for baby massage. A thick, sticky oil extremely high in vitamin E. Promotes cell regeneration and improves circulation of mature skin. Avoid using on those with Wheat allergies or Celiac disease.